After receiving approval from the Toronto Executive committee last week, the Toronto City Council formally passed a motion on Tuesday to study expanded gaming at Woodbine Racetrack. 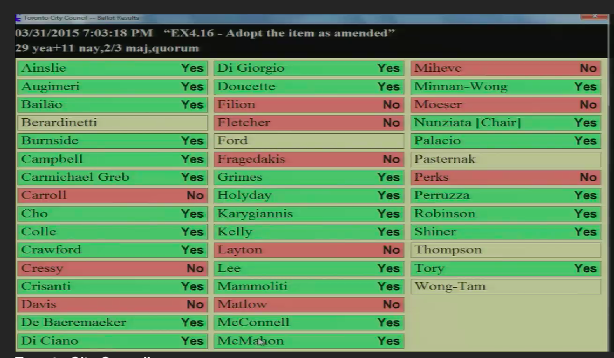 The vote passed late Tuesday by a vote of 29-11.
e. the identification of social and economic development objectives that the City may require as conditions for its approval of expanded gaming at Woodbine, to leverage any new development to benefit local Toronto residents and communities; including recommendations to encourage full time employment. k. the results of the public consultation, set out in Recommendation 1. Love reading your posts Will because you are spot on. Based off of last weeks response from a couple of participants I expect you will get the same reaction. Clearly the fans have not spoken as this is merely a Toronto city council motion. Clearly the fans have spoken, the residents of Toronto have spoken, and the slots and the games are a main reason people go to Woodbine. Not just the runners, the harness folk, not horses in general. This is a HUGE story to harness, that you need to wake up and realize, that Torontonians are not coming for you and in order for a company like WEG to survive, they need to expand the non-horse biz. Harness profits by having people leave the gaming floor and come check you out. Realize this.... if this was built at Ontario Place, or anywhere else, you would get no residual effect and have FAR fewer spill over people attend Woodbine. Businesses change..... grocery stores now sell clothes, toys, household items, garden supplies and much more than just food. Simply selling food was not enough. Loblaws is a prime example. If you think just you racing is enough, you are sorely mistaken. As long as you see other gambling as the competition, then you are missing how this works. This is about entertainment and as you can see by the packed slot parlours, racing isn't winning the competition for those dollars. Any spill-over you get, is a bonus for you. Even Wal-Mart knew it had to expand and now is in the drug store and grocery business. Gas Stations now have doughnut stores in them, or other fast food joints, sell gift cards for other stores, and even have deals where they get gas there, and get coupons to other business to survive. McDonalds was a burger joint, now they are a muffin and coffee shop, a breakfast place and have playlands to survive. You need to realize that these slots are helping you even if you are not getting the same revenue from them as you were. Go ahead and wish slots off your property and treat them like the enemy, and when you have no tracks left to race at, come back here for your "I told you so". I pray harness people, and more so, the older folks that are fighting the change and unable to see the evolution of gambling and entertainment get with how this works. Simply racing, isnt entertainment enough. One would suggest that WEG will be spending a lot of money promoting its destination in order to secure a larger entertainment facility. I hope they remember to include the fact that it is, and has for a very long time been a racetrack. Ensure the racing aspect is not forgotten. Why is this news for racing? Next, I am going to see a article on here about Bill C-290 being passed or daily fantasy has become legal!! You're own your own now horse racing.Why promote the competition! !